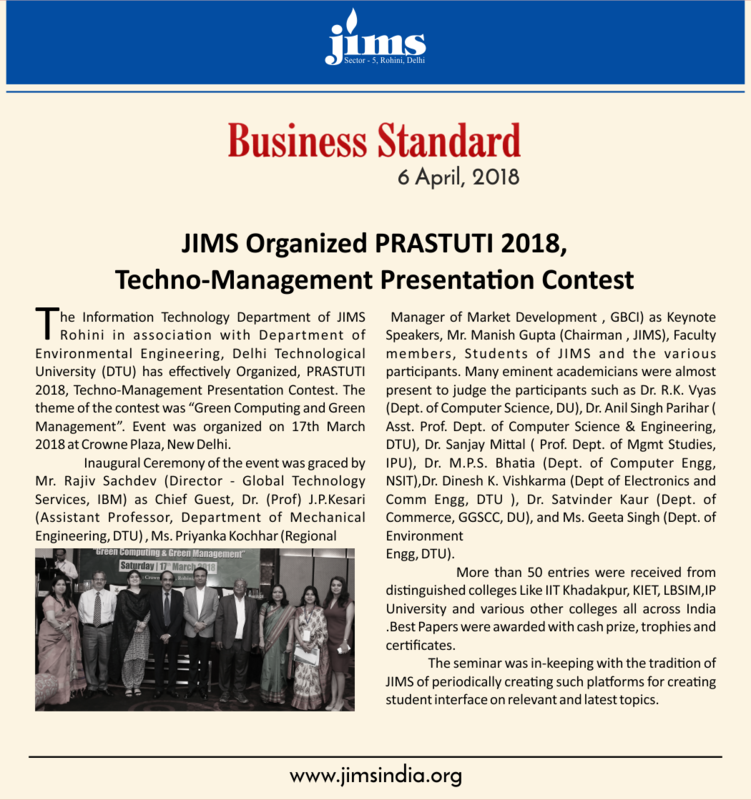 The Information Technology Department of JIMS Rohini in association with Department of Environmental Engineering, Delhi Technological University ( DTU) has effectively Organized, PRASTUTI 2018, Techno-Management Presentation Contest. The theme of the contest was “Green Computing and Green Management”. Event was organized on 17th March 2018 at Crowne Plaza, New Delhi. Inaugural Ceremony of the event was graced by Mr. Rajiv Sachdev (Director - Global Technology Services, IBM) as Chief Guest, Dr (Prof) J.P.Kesari (Assistant Professor, Department of Mechanical Engineering, DTU) , Ms. Priyanka Kochhar (Regional Manager of Market Development , GBCI) as Keynote Speakers, Mr. Manish Gupta (Chairman , JIMS), Faculty members, Students of JIMS and the various participants. Many eminent academicians were almost present to judge the participants such as Dr. R.K. Vyas (Dept. of Computer Science, DU), Dr. Anil Singh Parihar ( Asst. Prof. Dept. of Computer Science & Engineering, DTU), Dr. Sanjay Mittal ( Prof. Dept. of Mgmt Studies, IPU), Dr. M.P.S. Bhatia (Dept. of Computer Engg, NSIT), Dr. Dinesh K. Vishkarma (Dept of Electronics and Comm Engg, DTU ), Dr. Satvinder Kaur (Dept. of Commerce, GGSCC, DU), and Ms. Geeta Singh (Dept. of Environment Engg, DTU). More than 50 entries were received from distinguished colleges Like IIT Khadakpur, KIET, LBSIM,IP University and various other colleges all across India .Best Papers were awarded with cash prize, trophies and certificates. The seminar was in-keeping with the tradition of JIMS of periodically creating such platforms for creating student interface on relevant and latest topics.